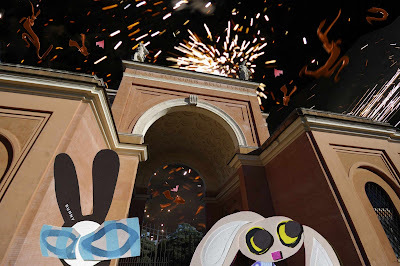 Just as the two hopped stealthily away, there was a multicoloured flash of light and the Wabbit made Lapinette duck as an incredible blast sent the Agents of Rabit spiralling high above the building. "There's something in the air," sang the Wabbit tunefully and he smiled and dusted his paws. Lapinette stared at the Wabbit. "That wasn't in Cardinal Lapin's plan," she gasped. "A little extra ingredient of my own, just to make sure," said the Wabbit. "Good grief Wabbit, you nearly took out the whole block," said Lapinette. "Skratch got me a small something from the Navy Surplus store," said the Wabbit. "Go on, tell me," sighed Lapinette. "A quantity of M789 Dual Purpose Incendiary," said the Wabbit, "why do you think we needed the battery?" "You could have told me," said Lapinette. "It wouldn't have been a surprise," said the Wabbit. Lapinette groaned. "How can you keep a detonator in your fur?" she asked. "I don't routinely go to the furdresser," said the Wabbit. "You're spooky," said Lapinette. "I'm a secret agent," said the Wabbit. Lapinette couldn't help laughing. "The Agents of Rabit won't be giggling now," she murmured. "Well, I don't know about that," grinned the Wabbit, "because now they're in bits."